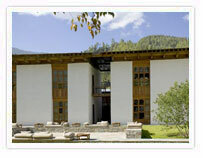 Amankora Paro is 24-suite pine forest retreat which contrasts the rustic with the contemporary. Nearby are the ruins of the 17th century Drukgyel Dzong. 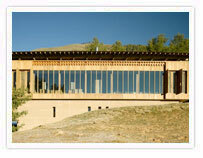 The resort’s architecture features natural rammed-earth walls, gently sloping roofs and wood paneled interiors. Suites provide travelers with a king-size bed, traditional bukhari (wood-burning stove) and a large terrazzo-clad bath. 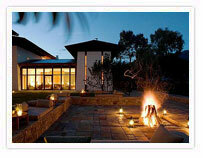 The lodge facility include a living room, dining room, library and outdoor terrace, all warmed by fireplaces. A welcome return from challenging treks is the Spa which overlooks the surrounding blue pine forest and herb garden.A glass walled sauna, treatment rooms with hot stone baths, yoga and meditation room are among the spa’s facilities. 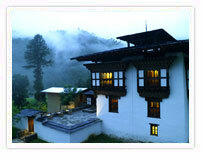 Historically Paro is believed to be one of the first valleys to have welcomed Buddhism in the Eastern Himalayas. Two 7th century temples bear splendid witness to that arrival-Kyichu Lhakhang and Taktsang Goemba. The National Museum displays an intriguing collection of artifacts that illustrate the rich culture and heritage of the Kingdom. A short stroll away is the dominating Paro Dzong. Set in a blue pine forest in the upper reaches of the Motithang area of the adjacent Thimphu valley, the 16-suite AmankoraThimphu is close to the capital sights and shopping while remaining a quiet retreat. 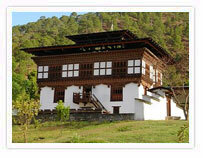 The Dzong-like architecture incorporates high stone, white-washed buildings. Stairs lead to a combined living and dining room with dramatic soaring ceilings and wood-panelled walls. An outdoor dining deck provides views of the nearby stream and forest. The Spa features three treatment rooms, changing rooms and steam rooms. Suites are identical to those of Amankora Gangtey. Features include wood-panelled walls, a king-size bed, reading chair, window banquette, and a bukhari (wood-burning stove). The spacious bathroom provides a terrazzo-clad bath which has a view of the pine forest through a small vertical window. As Bhutan's capital Thimphu is home to many attractions and activities, including the National Textile Museum, Folk Heritage Museum and the bustling weekend market. It also houses the seat of government and the office of His Majesty, King Jigme Khesar Namgyel Wangchuck. Thimphu's main street provides an opportunity to shop for Himalayan jewellery and Bhutanese handicrafts and textiles. The lodge includes a traditional Bhutanese farmhouse built as a residence by a previous Je Khenpo (spiritual and religious leader). This grand structure, with its preserved vegetable dye wall-paintings, houses the dining room and intimate relaxation area as well as traditional altar room for meditation. The courtyard is suitable for outdoor dining and relaxation in Punakha's temperate climate. Other facilities include a tea pavilion that was once the kitchen of the summer palace, and beyond is the yoga/meditation room with open views of the surrounding rice terraces and orchards. For relaxing there are the spa treatment room anda steam room. Identical in design to those of Amankora Paro, the eight suites are air-conditioned in the summer and set in an orange orchard with views across paddy fields. In the little visited Phobjikha valley near the unspoilt village of Gangtey the eight-suite Amankora Gangtey is set on a forested hill with scenic views of the valley floor and the dominant 16th century Gangtey Goemba (monastery). The valley is part of the Black Mountains National Park, one of the Bhutan's most important sanctuaries. Each winter it is home to a flock of 300 rare and endangered black-necked cranes which arrives from Tibet. The surrounding Black Mountains are mainly inhabited by shepherds and nomadic yak-herders. Lodge accommodation and guest facilities are in one structure. The combined living and dining room has comfortable chairs and sofas and dining tables with views through floor-to-ceiling windows. The lodge's ground level provides two massage treatment rooms and changing areas. Suite interiors are identical to those of Amankora Thimphu. Stay often begins with a walks through the Gangtey village before visiting the ancient altars and ramparts of massive Goemba. Numerous nature walks and treks are offered throughout the valley's varied terrain and, in winter the reclusive black-necked cranes can be seen from the nearby Crane Centre of a viewing hide set near their main nesting and feeding grounds. Adjacent to the first and second King of Bhutan's Palace, Wangdichholing, Amankora Bumthang lies within the town of Jakar in the Choekhor valley in an area commonly known as Bumthang. It is home to no less than 29 temples and monasteries, a museum and a treasure-trove of Bhutan's art and painting traditions. The 16-suite lodge is surrounded by an apple orchard with pear trees along its boundary with the Palace. A Dzong inspired hallway at the lodge's entrance opens onto a library and a comfortable living room appointed with lounge chairs, daybeds and a traditional bukhari (wood-buring stove). Floor-to-ceiling windows offer views of landscaped courtyard adjoining the shared Palace grounds. Adjacent is the dining room with its soaring 18ft ceiling. The Spa offers three cosy treatment rooms, a steam room and changing area. Each suite features wood-panelled interiors, a traditional bukhari, king-size bed, terrazzo chad bath, shower, twin vanities and daybed. The Choekhor valley is covered with fields of buckwheat and millet. Apple orchards climb up the slopes to mix with the deep pine forests. Across the valley is the many of the Kingdom's most auspicious and highly revered houses of worship and ancient monasteries, many decorated with still vibrant ancient wall paintings and richly adorned altars, all with colourful , mystical histories. Amankora Bumthang's neighbouring Wangdichholing Palace with built in 1857 as the Kingdom's first palace and is now the residence of a small monk body that also shares residence in an adjacent Goemba.